Anemone bulbs often benefit from a pre-planting soak to get them ready to grow. Before you head out to the garden to plant soak your anemone bulbs for 2-4 hours or overnight in a small bowl of water. This will encourage them to sprout faster and get growing so they develop a good network of roots their first autumn in the garden. Find a location where the soil drains well. If there are still water puddles 5-6 hours after a hard rain, scout out another site. Or amend the soil with the addition of organic material to raise the level 2-3" to improve the drainage. Peat moss, compost, ground bark or decomposed manure all work well and are widely available. While anemones aren't fussy about soil, they will perform best in soil that provides good drainage. Site your anemones where they will receive full to half day sun. Soak your bulbs for a few hours in lukewarm water to give them a little wake up call. While they are taking a dip you can prepare the soil, design your planting layout, run errands or simply relax. After planting, water anemones well, gently soaking the soil and settling it around the bulbs. Roots will form in the autumn. In warm areas some foiliage may also develop in the fall. Buds and flowers are produced in the spring. When in bloom, feel free to cut anemone flowers for little bouquets. This will not hurt the plants. At the end of the summer the leaves will yellow and die back as the plant slips into dormancy. Foliage many be removed at this point. Your anemones will rest for a few months before beginning the next growing cycle. Fill your containers with good quality, well-drained soil. Almost any commercially available potting medium will work fine. Make sure there are adequate drainage holes; anemones bulbs must never sit in waterlogged soil or they will rot. Soak your bulbs for a few hours or overnight in lukewarm water to give them a little wake up call. This will help them develop good strong roots their first autumn. 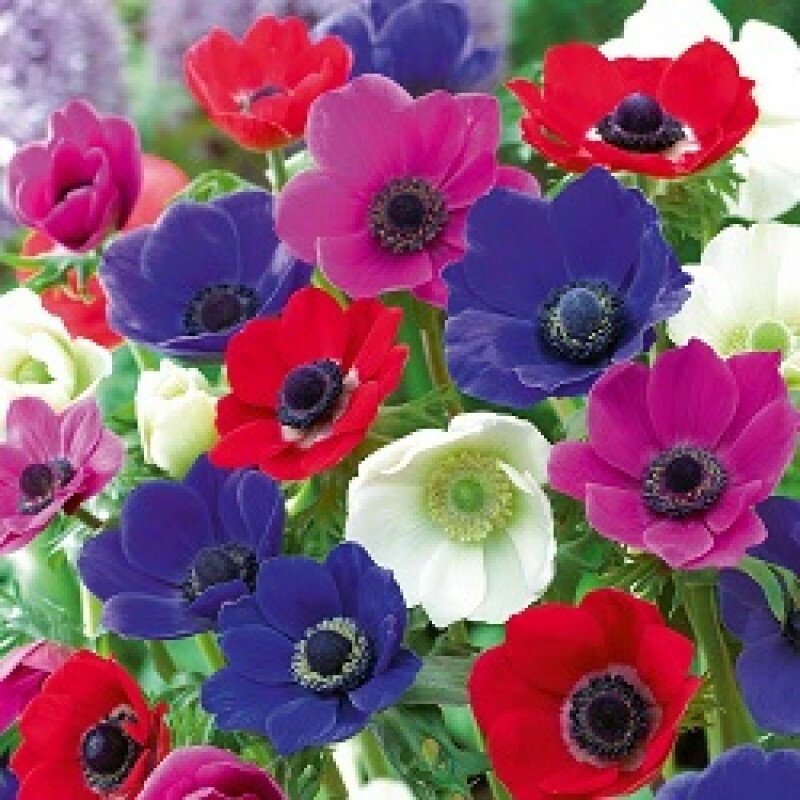 Dig holes and plant the anemones 1-2” down and just an inch or two apart for the most brilliant displays. Don't worry about which side of the bulb needs to face up. Regardless of how the bulbs are positioned they will still grow. Anemones typically can figure out which way is up. After planting, water your containers well, gently soaking the soil so it settles around the bulbs. Roots will form in the fall. In warm areas some foliage may also develop in the fall. Buds and flowers are produced in the spring. Enjoy your flowering containers, snipping a few flowers if you like. This won't hurt your plants. After blooming has finished for the season leave the foliage in place; don't cut it off. The leaves will gather sunlight, create food through photosynthesis and strengthen the bulbs for the future. Water as needed during active growth periods, about 1" per week.